Thursday December 1st (2-7pm) at the University Inn and Conference Center in downtown Lowell for a great holiday shopping alternative’ plus a chance to bid on amazing silent auction items. Join the action to bid on’. Drop by the University Inn & Conference Center in downtown Lowell on Dec. 1st (2-7pm) for our Women’s Works event to celebrate the creative women of Lowell ‘ and to raise funds to support the Center for Women & Work. Danielle Bergeron graduated from our program in 2007. As of June 14th, 2011, Danielle Bergeron is now the President and CEO of the Greater Lowell Chamber of Commerce. This organization has a mission that includes : ‘ ‘. bringing members of the business community together to unify them to produce initiatives that serve their interest in ensuring their community is a place where they want to locate and sustain their business.’ The organization cited Danielle’s ”energy, charisma and marketing sense” as one of the reasons she was named president. On September 22nd, 2011 this organization hosted their 16th annual business expo bringing together over 1000 attendees to intermingle with Greater Lowell local businesses. This event was just one of many events the GLCCB hosts in the regions of Billerica, Dracut, Lowell, Chelmsford, Tewksbury, Tyngsboro and Westford. Danielle can be seen on the cover of the September 2011 issue of Journal Magazine touting the event. Following her graduation from the Community Social Psychology program at UML, Danielle started a business called Frills and Thrills Wedding and Events, a company specializing in wedding and event planning in the Lowell area. In the years after she has also moved into teaching about how to effectively use social media both through her company and as an adjunct professor at Middlesex Community College. 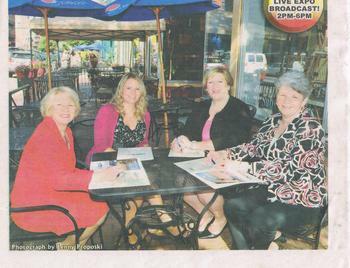 When she is not working at the GLCC or Thrills and Frills, Danielle also co-hosts a radio talk show entitled ‘Business Lunch with the Greater Lowell Chamber of Commerce’ with Jeanne Osbourne on 980 WCAP. According to her LinkedIn profile, Danielle also is involved in many other organizations with her community of Lowell. These include, but are not limited to, Young Professionals of Greater Lowell (Secretary), Merrimack Valley Food Bank (Secretary), Salvation Army (Public Relations Committee Chair) and UMass Lowell’s College of Fine Arts, Humanities and Social Sciences Advisory Board. Post written by Dan Bach. Special thanks to Professor Richard Siegel for bringing this article to our attention. Do you have know someone or an organization that deserves a spotlight? Feel free to send me suggestions at nellie_tran@uml.edu.